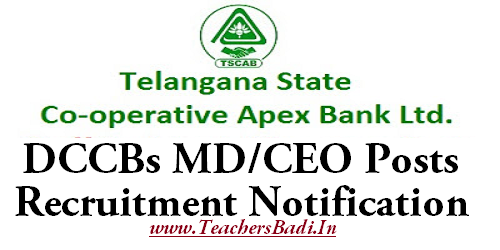 TSCAB DCCBs MD/CEO Posts 2017 Recruitment Notification: Telangana State Co-operative Apex Bank Ltd(TSCAB) has given the Managing Director/ Chief Executive Officer posts recruitment notification on 4th October 2017 and Applications are invited for appointment to the post of MD/CEOs of 5 DCCBs, viz. Hyderabad, Mahabubnagar, Karimnagar, Khammam & Warangal District Coperative Central Banks(DCCBs) from suitable candidates who will fulfill the fit and Proper Criteria prescribed by RBI /NABARD for filling up the following vacancies by direct recruitment, through IBPS. About: Consequent to the reorganisation of the state of Andhra Pradesh, the erstwhile unified Andhra Pradesh State Cooperative Bank (APCOB) was reorganised/reconstituted into the Telangana State Cooperative Apex Bank limited (TSCAB) for the state of Telangana and the Andhra Pradesh State Cooperative Bank (APCOB) for the state of residual Andhra Pradesh. Telangana State Cooperative Apex Bank Limited (TSCAB) was registered on 25.03.2017 and is a State Partnered Bank, committed to rural and agriculture development in the State of Telangana, catering to the agricultural credit needs of the farmer members of 797 Primary Cooperative Credit Societies through 9 District Cooperative Central Banks (DCCBs) and their 249 Branches. For its own, the TSCAB has 35 branches, spread in the twin cities of Hyderabad and Secunderabad, meeting the needs of urban clientele, through attractive deposit schemes, safe deposit locker facilities, vehicle loans, gold loans, housing loans and other e-channel services. TSCAB works in a totally computerized environment through the Core Banking solution (CBS). Age Limit:applicant shall preferably be not above 55 years of age as on 30.05.2017. The applicant shall have atleast Eight (8) years work experience at the Middle/Senior level in the Banking Sector (documentary evidence pertaining to the proof of having worked in the Middle/Senior Level for the required period shall be enclosed). 1. The appointment shall be for an initial period of 3 years on deputation/contract basis. 3. Candidates working in Government/Public Sector Undertakings/Autonomous Organizations/Cooperatives/Voluntary Organizations should apply through Proper Channel. They may submit advance copies before the last date, to avoid any delay in forwarding of their applications. 4. In case of candidates who have resigned or taken voluntary retirement from service, other-wise eligible as per the fit & proper criteria, they have to submit their relieving certificate and other relevant records required for the purpose. Applications are also made available with the DGM (HRD), TSCAB HO, Troop Bazar, Hyd., and can be obtained on payment of Rs.500/- by way of D.D drawn in favour of TSCAB, Hyd., or on remittance of cash at Bank HO, during the office hours, i.e., 10.30AM to 5.30 PM on week days and from 10.30 AM to 2.30 PM on Saturdays, during the period from 30.05.2017 to 13.06.2017. 1. A recent passport size photo is to be pasted on the application in the space provided.Application should be accompanied by attested true copies of certificates pertaining to proof of date of birth, qualifications, experience and other credentials.Applications along with the general conditions can be downloaded from the Bank’swebsite www.tscab.org. 2. Interested candidates may submit their application form, in the prescribed format, enclosing all supporting relevant documents and testimonials along with a latest self-attested passport size photo, in closed envelope, which should be addressed to the President, Telangana State Coop. Apex Bank Ltd., Head Office, Troop Bazar, Hyderabad - 500001. THE POST OF MD/CEO, TELANGANA STATE COOPERATIVE APEX BANK LTD.